I was going to post a poem I wrote about waiting for confirmation into YWAM, but today Dave and I received our acceptance letter to school!! We leave in 102 days. 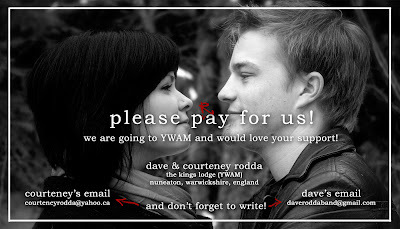 This entry was posted on Tuesday, June 10th, 2008 at 4:16 pmand is filed under school, The Kings Lodge, YWAM. You can follow any responses to this entry through the RSS 2.0 feed. You can leave a response, or trackback from your own site.